Parkinson's First Law: Work expands so as to fill the time available for its completion. Parkinson's Law or the Pursuit of Progress1 (1958), 4. Parkinson's Third Law: Expansion means complexity, and complexity decay. In Laws and Outlaws (1962), 168. Question: A hollow indiarubber ball full of air is suspended on one arm of a balance and weighed in air. The whole is then covered by the receiver of an air pump. Explain what will happen as the air in the receiver is exhausted. Answer: The ball would expand and entirely fill the vessell, driving out all before it. The balance being of greater density than the rest would be the last to go, but in the end its inertia would be overcome and all would be expelled, and there would be a perfect vacuum. The ball would then burst, but you would not be aware of the fact on account of the loudness of a sound varying with the density of the place in which it is generated, and not on that in which it is heard. Question: State the relations existing between the pressure, temperature, and density of a given gas. How is it proved that when a gas expands its temperature is diminished? Answer: Now the answer to the first part of this question is, that the square root of the pressure increases, the square root of the density decreases, and the absolute temperature remains about the same; but as to the last part of the question about a gas expanding when its temperature is diminished, I expect I am intended to say I don't believe a word of it, for a bladder in front of a fire expands, but its temperature is not at all diminished. All fossil anthropoids found hitherto have been known only from mandibular or maxillary fragments, so far as crania are concerned, and so the general appearance of the types they represented had been unknown; consequently, a condition of affairs where virtually the whole face and lower jaw, replete with teeth, together with the major portion of the brain pattern, have been preserved, constitutes a specimen of unusual value in fossil anthropoid discovery. Here, as in Homo rhodesiensis, Southern Africa has provided documents of higher primate evolution that are amongst the most complete extant. Apart from this evidential completeness, the specimen is of importance because it exhibits an extinct race of apes intermediate between living anthropoids and man ... Whether our present fossil is to be correlated with the discoveries made in India is not yet apparent; that question can only be solved by a careful comparison of the permanent molar teeth from both localities. It is obvious, meanwhile, that it represents a fossil group distinctly advanced beyond living anthropoids in those two dominantly human characters of facial and dental recession on one hand, and improved quality of the brain on the other. Unlike Pithecanthropus, it does not represent an ape-like man, a caricature of precocious hominid failure, but a creature well advanced beyond modern anthropoids in just those characters, facial and cerebral, which are to be anticipated in an extinct link between man and his simian ancestor. At the same time, it is equally evident that a creature with anthropoid brain capacity and lacking the distinctive, localised temporal expansions which appear to be concomitant with and necessary to articulate man, is no true man. It is therefore logically regarded as a man-like ape. I propose tentatively, then, that a new family of Homo-simidÃ¦ be created for the reception of the group of individuals which it represents, and that the first known species of the group be designated Australopithecus africanus, in commemoration, first, of the extreme southern and unexpected horizon of its discovery, and secondly, of the continent in which so many new and important discoveries connected with the early history of man have recently been made, thus vindicating the Darwinian claim that Africa would prove to be the cradle of mankind. 'Australopithicus africanus: The Man-Ape of South Africa', Nature, 1925, 115, 195. Anyone informed that the universe is expanding and contracting in pulsations of eighty billion years has a right to ask. What's in it for me? The Glory of the Hummingbird (1974), 6. In Bill Swainson, Encarta book of Quotations (2000), 265. Despite the continuing expansion or even explosion of information, there will forever be limits beyond which the devices of science cannot lead a man. In Boundaries of the Soul (1972, 1994), 378. 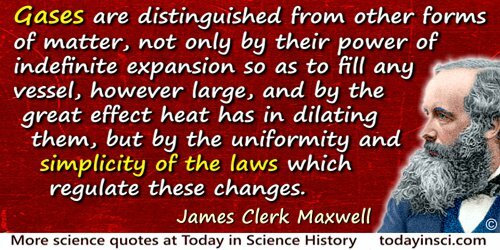 Gases are distinguished from other forms of matter, not only by their power of indefinite expansion so as to fill any vessel, however large, and by the great effect heat has in dilating them, but by the uniformity and simplicity of the laws which regulate these changes. Theory of Heat (1904), 31. If our intention had been merely to bring back a handful of soil and rocks from the lunar gravel pit and then forget the whole thing, we would certainly be history's biggest fools. But that is not our intention now—it never will be. What we are seeking in tomorrow's [Apollo 11] trip is indeed that key to our future on earth. We are expanding the mind of man. We are extending this God-given brain and these God-given hands to their outermost limits and in so doing all mankind will benefit. All mankind will reap the harvest…. What we will have attained when Neil Armstrong steps down upon the moon is a completely new step in the evolution of man. Banquet speech on the eve of the Apollo 11 launch, Royal Oaks Country Club, Titusville (15 Jul 1969). In "Of a Fire on the Moon", Life (29 Aug 1969), 67, No. 9, 34. If the expansion of the space of the universe is uniform in all directions, an observer located in anyone of the galaxies will see all other galaxies running away from him at velocities proportional to their distances from the observer. The Creation of the Universe (1952), 31. In a sense cosmology contains all subjects because it is the story of everything, including biology, psychology and human history. In that single sense it can be said to contain an explanation also of time's arrow. But this is not what is meant by those who advocate the cosmological explanation of irreversibility. They imply that in some way the time arrow of cosmology imposes its sense on the thermodynamic arrow. I wish to disagree with this view. The explanation assumes that the universe is expanding. While this is current orthodoxy, there is no certainty about it. The red-shifts might be due to quite different causes. For example, when light passes through the expanding clouds of gas it will be red-shifted. A large number of such clouds might one day be invoked to explain these red shifts. It seems an odd procedure to attempt to 'explain' everyday occurrences, such as the diffusion of milk into coffee, by means of theories of the universe which are themselves less firmly established than the phenomena to be explained. Most people believe in explaining one set of things in terms of others about which they are more certain, and the explanation of normal irreversible phenomena in terms of the cosmological expansion is not in this category. 'Thermodynamics, Cosmology) and the Physical Constants', in J. T. Fraser (ed. ), The Study of Time III (1973), 117-8. Is what you are doing fun? Of course, physics is also fun—indeed it is an enjoyable way of life. One reason physics is fun is that each element of progress transforms an area of ignorance into knowledge, but it also creates, as a by-product, an amount of new and additional ignorance in excess of that which was reduced to understanding. Thus, the volume of delicious ignorance we produce is ever-expanding, like our exponentially exploding universe. It has been suggested that thermodynamic irreversibility is due to cosmological expansion. 'Thermodynamics, Cosmology, and the Physical Constants', in J. T. Fraser (ed. ), The Study of Time III (1973), 117-8. It is the business of science to offer rational explanations for all the events in the real world, and any scientist who calls on God to explain something is falling down on his job. This applies as much to the start of the expansion as to any other event. If the explanation is not forthcoming at once, the scientist must suspend judgment: but if he is worth his salt he will always maintain that a rational explanation will eventually be found. This is the one piece of dogmatism that a scientist can allow himself—and without it science would be in danger of giving way to superstition every time that a problem defied solution for a few years. The Mystery of the Expanding Universe (1964), 122. It would seem at first sight as if the rapid expansion of the region of mathematics must be a source of danger to its future progress. Not only does the area widen but the subjects of study increase rapidly in number, and the work of the mathematician tends to become more and more specialized. It is, of course, merely a brilliant exaggeration to say that no mathematician is able to understand the work of any other mathematician, but it is certainly true that it is daily becoming more and more difficult for a mathematician to keep himself acquainted, even in a general way, with the progress of any of the branches of mathematics except those which form the field of his own labours. I believe, however, that the increasing extent of the territory of mathematics will always be counteracted by increased facilities in the means of communication. Additional knowledge opens to us new principles and methods which may conduct us with the greatest ease to results which previously were most difficult of access; and improvements in notation may exercise the most powerful effects both in the simplification and accessibility of a subject. It rests with the worker in mathematics not only to explore new truths, but to devise the language by which they may be discovered and expressed; and the genius of a great mathematician displays itself no less in the notation he invents for deciphering his subject than in the results attained. … I have great faith in the power of well-chosen notation to simplify complicated theories and to bring remote ones near and I think it is safe to predict that the increased knowledge of principles and the resulting improvements in the symbolic language of mathematics will always enable us to grapple satisfactorily with the difficulties arising from the mere extent of the subject. In Presidential Address British Association for the Advancement of Science, Section A., (1890), Nature, 42, 466. One of my inventions was a large thermometer made of an iron rod, … The expansion and contraction of this rod was multiplied by a series of levers … so that the slightest change in the length of the rod was instantly shown on a dial about three feet wide multiplied about thirty-two thousand times. The zero-point was gained by packing the rod in wet snow. The scale was so large that … the temperature read while we were ploughing in the field below the house. From The Story of My Boyhood and Youth (1913), 258-259. One of the inventions made while growing up on his father’s farm, before he left the year after he was 21. One point at which our magicians attempt their sleight-of-hand is when they slide quickly from the Hubble, redshift-distance relation to redshift-velocity of expansion. There are now five or six whole classes of objects that violate this absolutely basic assumption. It really gives away the game to realize how observations of these crucial objects have been banned from the telescope and how their discussion has met with desperate attempts at suppression. One [idea] was that the Universe started its life a finite time ago in a single huge explosion, and that the present expansion is a relic of the violence of this explosion. This big bang idea seemed to me to be unsatisfactory even before detailed examination showed that it leads to serious difficulties. In radio talk on the BBC Third Programme, as subsequently printed in the BBC’s The Listener magazine (9 Mar 1950), Vol.43, 420. This was his further use of the term “big bang” that he first expressed in a radio talk on 28 Mar 1949. Scientists alone can establish the objectives of their research, but society, in extending support to science, must take account of its own needs. As a layman, I can suggest only with diffidence what some of the major tasks might be on your scientific agenda, but … First, I would suggest the question of the conservation and development of our natural resources. In a recent speech to the General Assembly of the United Nations, I proposed a world-wide program to protect land and water, forests and wildlife, to combat exhaustion and erosion, to stop the contamination of water and air by industrial as well as nuclear pollution, and to provide for the steady renewal and expansion of the natural bases of life. From Address to the Centennial Convocation of the National Academy of Sciences (22 Oct 1963), 'A Century of Scientific Conquest'. Online at The American Presidency Project. So-called extraordinary events always split into two extremes naturalists who have not witnessed them: those who believe blindly and those who do not believe at all. The latter have always in mind the story of the golden goose; if the facts lie slightly beyond the limits of their knowledge, they relegate them immediately to fables. The former have a secret taste for marvels because they seem to expand Nature; they use their imagination with pleasure to find explanations. To remain doubtful is given to naturalists who keep a middle path between the two extremes. They calmly examine facts; they refer to logic for help; they discuss probabilities; they do not scoff at anything, not even errors, because they serve at least the history of the human mind; finally, they report rather than judge; they rarely decide unless they have good evidence. Quoted in Albert V. Carozzi, Histoire des sciences de la terre entre 1790 et 1815 vue à travers les documents inédités de la Societé de Physique et d'Histoire Naturelle de Genève, trans. Albert V. and Marguerite Carozzi. (1990), 175. The generation of seeds ... is therefore marvelous and analogous to the other productions of living things. For first of all an umbilicus appears. ... Its extremity gradually expands and after gathering a colliquamentous ichor becomes analogous to an amnion. ... In the course of time the seed or fetus begins to become visible. 'On the Developmental Process', in H. B. Adelmann (ed. ), Marcello Malpighi and the Evolution of Embryology (1966), Vol. 2, 850. Stories of Inventors and Discoverers in Science and the Useful Arts (1860), 145. The present theory of relativity is based on a division of physical reality into a metric field (gravitation) on the one hand and into an electromagnetic field and matter on the other hand. In reality space will probably be of a uniform character and the present theory will be valid only as a limiting case. For large densities of field and of matter, the field equations and even the field variables which enter into them will have no real significance. One may not therefore assume the validity of the equations for very high density of field and matter, and one may not conclude that the 'beginning of the expansion' must mean a singularity in the mathematical sense. All we have to realise is that the equations may not be continued over such regions. In O. Nathan and H. Norden (eds. ), Einstein on Peace (1960), 640. The radius of space began at zero; the first stages of the expansion consisted of a rapid expansion determined by the mass of the initial atom, almost equal to the present mass of the universe. If this mass is sufficient, and the estimates which we can make indicate that this is indeed so, the initial expansion was able to permit the radius to exceed the value of the equilibrium radius. 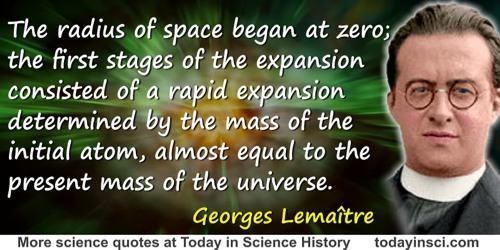 The expansion thus took place in three phases: a first period of rapid expansion in which the atom-universe was broken into atomic stars, a period of slowing-down, followed by a third period of accelerated expansion. It is doubtless in this third period that we find ourselves today, and the acceleration of space which followed the period of slow expansion could well be responsible for the separation of stars into extra-galactic nebulae. From 'La formation des Nebuleuses dans l’Univers en Expansion', Comptes Rendus (1933), 196, 903-904. As translated in Helge Kragh, Cosmology and Controversy: The Historical Development of Two Theories of the Universe (1996), 52. The technologies which have had the most profound effects on human life are usually simple. A good example of a simple technology with profound historical consequences is hay. Nobody knows who invented hay, the idea of cutting grass in the autumn and storing it in large enough quantities to keep horses and cows alive through the winter. All we know is that the technology of hay was unknown to the Roman Empire but was known to every village of medieval Europe. Like many other crucially important technologies, hay emerged anonymously during the so-called Dark Ages. According to the Hay Theory of History, the invention of hay was the decisive event which moved the center of gravity of urban civilization from the Mediterranean basin to Northern and Western Europe. The Roman Empire did not need hay because in a Mediterranean climate the grass grows well enough in winter for animals to graze. North of the Alps, great cities dependent on horses and oxen for motive power could not exist without hay. So it was hay that allowed populations to grow and civilizations to flourish among the forests of Northern Europe. Hay moved the greatness of Rome to Paris and London, and later to Berlin and Moscow and New York. ... Great inventions like hay and printing, whatever their immediate social costs may be, result in a permanent expansion of our horizons, a lasting acquisition of new territory for human bodies and minds to cultivate. Infinite In All Directions (1988, 2004), 135. The book is a revised version of a series of the Gifford Lectures under the title 'In Praise of Diversity', given at Aberdeen, Scotland. The theory here developed is that mega-evolution normally occurs among small populations that become preadaptive and evolve continuously (without saltation, but at exceptionally rapid rates) to radically different ecological positions. The typical pattern involved is probably this: A large population is fragmented into numerous small isolated lines of descent. Within these, inadaptive differentiation and random fixation of mutations occur. Among many such inadaptive lines one or a few are preadaptive, i.e., some of their characters tend to fit them for available ecological stations quite different from those occupied by their immediate ancestors. Such groups are subjected to strong selection pressure and evolve rapidly in the further direction of adaptation to the new status. The very few lines that successfully achieve this perfected adaptation then become abundant and expand widely, at the same time becoming differentiated and specialized on lower levels within the broad new ecological zone. Tempo and Mode in Evolution (1944), 123. The truly scientific mind is altogether unafraid of the new, and while having no mercy for ideas which have served their turn or shown their uselessness, it will not grudge to any unfamiliar conception its moment of full and friendly attention, hoping to expand rather than to minimize what small core of usefulness it may happen to contain. In 'Observation and Experiment and Their Use in the Medical Sciences', British Medical Journal (1930), 2, 129-34. As cited in Edward J. Huth and T.J. Murray, Medicine in Quotations: Views of Health and Disease Through the Ages (2006), 357 and 512. The vigorous branching of life’s tree, and not the accumulating valor of mythical marches to progress, lies behind the persistence and expansion of organic diversity in our tough and constantly stressful world. And if we do not grasp the fundamental nature of branching as the key to life’s passage across the geological stage, we will never understand evolution aright. The worst thing that will probably happen—in fact is already well underway—is not energy depletion, economic collapse, conventional war, or the expansion of totalitarian governments. As terrible as these catastrophes would be for us, they can be repaired in a few generations. The one process now going on that will take millions of years to correct is loss of genetic and species diversity by the destruction of natural habitats. This is the folly our descendants are least likely to forgive us. There are three reasons why, quite apart from scientific considerations, mankind needs to travel in space. The first reason is garbage disposal; we need to transfer industrial processes into space so that the earth may remain a green and pleasant place for our grandchildren to live in. The second reason is to escape material impoverishment; the resources of this planet are finite, and we shall not forgo forever the abundance of solar energy and minerals and living space that are spread out all around us. The third reason is our spiritual need for an open frontier. The ultimate purpose of space travel is to bring to humanity, not only scientific discoveries and an occasional spectacular show on television, but a real expansion of our spirit. In Disturbing the Universe (1979). Those who are unacquainted with the details of scientific investigation have no idea of the amount of labour expended in the determination of those numbers on which important calculations or inferences depend. They have no idea of the patience shown by a Berzelius in determining atomic weights; by a Regnault in determining coefficients of expansion; or by a Joule in determining the mechanical equivalent of heat. In Sound: A Course of Eight Lectures Delivered at the Royal Institution of Great Britain (1867), 26. Very old and wide-spread is the opinion that forests have an important impact on rainfall. ... If forests enhance the amount and frequency of precipitation simply by being there, deforestation as part of agricultural expansion everywhere, must necessarily result in less rainfall and more frequent droughts. This view is most poignantly expressed by the saying: Man walks the earth and desert follows his steps! ... It is not surprising that under such circumstances the issue of a link between forests and climate has ... been addressed by governments. Lately, the Italian government has been paying special attention to reforestation in Italy and its expected improvement of the climate. ... It must be prevented that periods of heavy rainfall alternate with droughts. ...In the Unites States deforestation plays an important role as well and is seen as the cause for a reduction in rainfall. ... committee chairman of the American Association for Advancement of Science demands decisive steps to extend woodland in order to counteract the increasing drought. ... some serious concerns. In 1873, in Vienna, the congress for agriculture and forestry discussed the problem in detail; and when the Prussian house of representatives ordered a special commission to examine a proposed law pertaining to the preservation and implementation of forests for safeguarding, it pointed out that the steady decrease in the water levels of Prussian rivers was one of the most serious consequences of deforestation only to be rectified by reforestation programs. It is worth mentioning that ... the same concerns were raised in Russia as well and governmental circles reconsidered the issue of deforestation. What I have related is sufficient for establishing the main principle, namely, that the heat which disappears in the conversion of water into vapour, is not lost, but is retained in vapour, and indicated by its expansive form, although it does not affect the thermometer. This heat emerges again from this vapour when it becomes water, and recovers its former quality of affecting the thermometer; in short, it appears again as the cause of heat and expansion. Lectures on the Elements of Chemistry, delivered in the University of Edinburgh (1803), Vol. I, 173. Your breathing. The beating of your heart. The expansion of your lungs. Your mere presence is all that is needed to establish your worth. …the Form or true definition of heat … is in few words as follows: Heat is a motion; expansive, restrained, and acting in its strife upon the smaller particles of bodies. But the expansion is thus modified; while it expands all ways, it has at the same time an inclination upward. And the struggle in the particles is modified also; it is not sluggish, but hurried and with violence. Novum Organum (1620), Book 2, Aphorism 20. Translated as 'First Vintage Concerning the Form of Heat', The New Organon: Aphorisms Concerning the Interpretation of Nature and the Kingdom of Man), collected in James Spedding, Robert Ellis and Douglas Heath (eds. ), The Works of Francis Bacon (1857), Vol. 4, 154-5.